Using offshore systems to subvert a communication network to deliver ads for gambling, controlled substances and quack cures. Sure sounds like spam to me. Broadcasting stations without a country seek new ways to flood the United States with radio advertising barred by federal commission. Two hundred outlaws face war by the government. RADIO circles on the Pacific Coast were turned topsy turvy not long ago by the; continued presence of a radio pirate ship which had taken unto itself a very popular spot on the dial and started broadcasting without regard for the land stations with which it interfered. 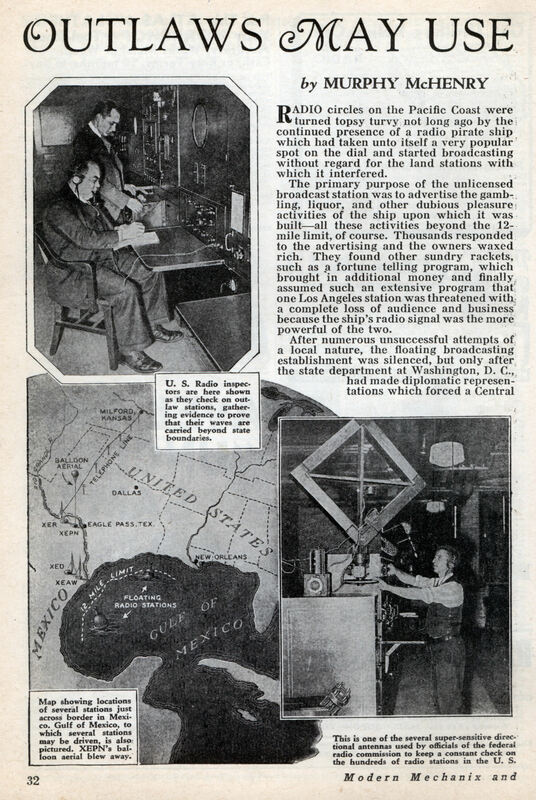 The primary purpose of the unlicensed broadcast station was to advertise the gambling, liquor, and other dubious pleasure activities of the ship upon which it was builtâ€”all these activities beyond the 12-mile limit, of course. Thousands responded to the advertising and the owners waxed rich. 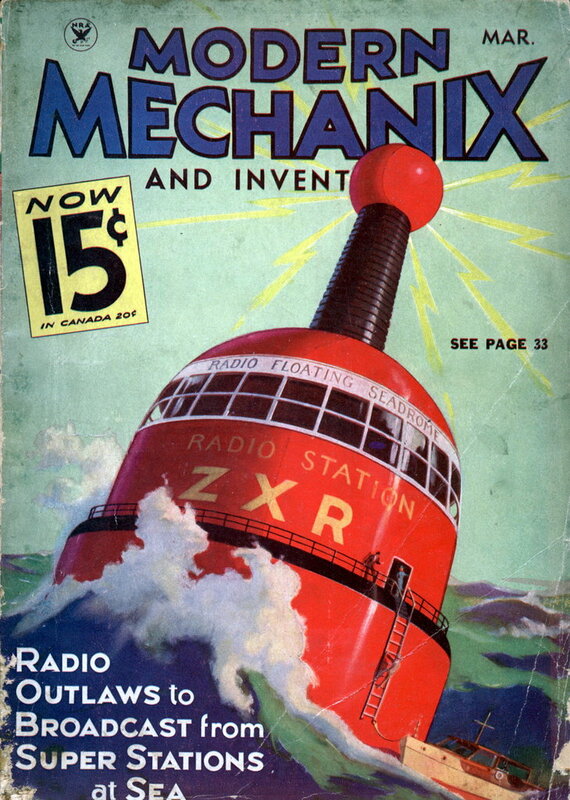 They found other sundry rackets, such as a fortune telling program, which brought in additional money and finally assumed such an extensive program that one Los Angeles station was threatened with; a complete loss of audience and business because the ship’s radio signal was the more powerful of the two. After numerous unsuccessful attempts of a local nature, the floating broadcasting establishment was silenced, but only after the state department at Washington, D. C, had made diplomatic representations which forced a Central American country to cancel the ship’s registry. However, this ship had paved the way and now, with the United States making headway in its light to muzzle stations just south of the Rio Grande river, within the shelter of Mexico, it appears that soon floating broadcast palaces may be dotted here and there outside the 12 mile limit, particularly in the Gulf of Mexico. There is little chance that the border broadcasters will give up without a struggle. Led by XER’s spectacular Dr. John R. Brinkley, formerly of Milford, Kansas, and now of Del Rio, Texas, they have found too many ways to gather in otherwise hard earned dollars to sit by complacently and be permanently hushed. Dr. Brinkley has made millions of dollars as a result of his broadcasts. Others, working along numerous lines, have taken in many more millions. And that is why, in the face of possibilities that they may be driven out of Mexico, these promotional minded broadcasters – are putting up a brilliant struggle. That is also the reason why, as they battle for further privileges in Mexico, they are showing deep interest in the possibility of operating from beyond the 12 mile limit. To do so, they would have to secure ship registry from some nation, but it is well known that there are a number of Central and South American countries which would welcome the chance for added governmental revenue, for these broadcasters, barred from the United States, are accustomed to paying handsome taxes in Mexico. All the so-called “radio pirates” are not across the border or out on the high seas. A. D. Ring, principal engineer of the-federal radio commission, says that at least 200 outlaw stations have been under surveillance in the United States alone. Most of these stations operate on from one to five watts power and claim immunity from federal restrictions on the assertion that their radio waves do not travel from one state to another. However, supersensitive equipment employed by federal investigators has broken down this claim and as a consequence many such station operators have been indicted and held for trial in the federal courts. In addition to the type of business indulged in, the stations in Mexico have stirred up great protest because they provide serious interference with many stations in the United States. There never has been any radio treaty or agreement between the United States and Mexico, such as this country has with Canada. In many circles this has been accepted as a diplomatic insult and as a consequence almost anybody wanting to build a radio station can secure a permit from the Mexican government. Quite naturally, this situation appeals most to those broadcasters who cannot carry on their operations in the United States. Men who have definitely been barred from radio privileges in this country have quickly turned to Mexico, built super-power stations and easily reached the millions of American homes possessing radio sets. There is no known means of barring radio waves where they have sufficient force and power to cross political or physical boundaries. Dr. Brinkley was one of the early border operators. He turned to Mexico when the federal radio commission closed his famous Station KFKB, at Milford, Kansas. And now Dr. Brinkley, and others, may be forced to turn elsewhere, possibly to the high seas, in order to continue the radio invasion of the United States. For just as Dr. Brinkley was contemplating the increase of power on XER from 150,000 watts to 500,000 watts, the Mexican authorities issued new rules. Dr. Brinkley, along with other border broadcasters, has started to fight in the courts of Mexico. For the rules, if enforced, would make it impossible to carry on profitably. Specifically, they provide: 1. Discontinuance of remote control lines originating outside of Mexico. 2. Elimination of advertising of any medical product which is not approved by Mexican health authorities. 3. Discontinuance of mentalist acts, question and answer hours and the like, except by special permission from the Mexican radio department. 4. Designation of the Spanish language as the official language in which all broadcasts must be made, except in cases where special permission is obtained for broadcasts in another language, such as English. Brinkley Minus Passport Dr. Brinkley is fighting. He is refused a passport into Mexico, ostensibly through the efforts of the American Medical Association, and elimination of his remote control line would make it impossible for him to talk on his own radio station. Without permission to advertise his medicines and gland operations, he would have little incentive to talk in such an expensive manner. Cancelling the question and answer program would deprive XER of about $10,000 a month. If he is not successful in his fight to have the drastic new orders rescinded, Dr. Brinkley will not quit. That much is certain. He will be ready to build his station either on a ship or in some friendly Central American country which would appreciate added tax revenues. Other border broadcasters would no doubt follow suit, for they are more or less depending upon the leadership of Dr. Brinkley in this latest battle. The doctor is right on the battle ground. He has closed his Milford, Kansas, establishment, and moved to Del Rio, Texas, with his full staff. Elimination of the intricate remote control line from Milford to the radio station in Mexico effected a saving of approximately $10,000 a month. Closely watching every move made by Dr. Brinkley is Norman Baker, another well publicized broadcaster now exiled from the United States, so far as radio is concerned. Baker, who came into the toils of law through advertising and operation of a cancer clinic at Muscatine, Iowa, has his new 150,000 watt transmitter, XENT, nearing completion at Nuevo Laredo, just opposite the important border city of Laredo, Texas. Baker’s fate will largely depend upon Dr. Brinkley’s ability to invalidate the nonmedical advertising order. Battle of Power Seen If Dr. Brinkley should increase his station’s power to 500,000 watts, it will place Mexico on a radio par with the United States, for WLW at Cincinnati is soon to begin operation on that strength. With two such high powered stations on the dial, many fear that numerous adjacent small stations will be drowned out by interference. However, WLW will be under governmental regulations which require that it remain within five cycles of its assigned frequency. In all probability Mexico, for the protection of its own listening audiences, will invoke the same rule, which will in a measure alleviate much interference. The proposal of Dr. Brinkley to float his station in the event of further trouble with Mexico, brings up the interesting possibility that several such stations might be constructed in favorable locations with proper credentials from a recognized government. The most famous such station in North America was XERF-AM the home of the Wolfman Jack show. The broadcast could be picked up in at least seven states. The station was immortalized in the ZZ Top song “I Heard It on the X”. The UK was more fodder for pirate broadcasting because of the monopoly of the BBC. Rock and Roll was limited to just a couple of hours per day and seldom more than the top ten hits. And now pop music’s limited to Clearchannel subsidiaries anf their top forty hits. Hurrah freedom. As a Costa Rican youngster in the before the mid 1960s, I kept awake late at night, 11 p.m., waiting for long distance propagation on the BC band, which payed my fondest memories as I discovered WLAC 1510 Nashville and fell in love with R&B. But, one night going up the band I found XERF 1570 Del RÃ­o, Texas. I didn’t care what they were selling, but the music did it all, supported by this one of kind personlity, Wolfman Jack, who used to ID each song with this echo-wolf that sounded great in the still of the night. The years went by and next time I heard about the Wolfman was on the American Graffiti film. At last, I knew one of my heroes. Next time was his passing an his real name was Robert Smith. Nowadays, he has “returned” from the grave as Dutch station The Mighty KBC is running his show on 6055 and 6040 kHz short wave. But, nothing compares those memorable days of the Border Blaster. Kudos to the guy who thought this up, brilliant idea. Yeah, it would be doubtful if it were a real invention but you have to admit that as a purely creative concept it is a cool way for the guy to promote his music. By the way the zeusaphone was very cool too. Thanks for sharing. Only one mention of the quack ‘gland’ operations? I don’t see how they could work without killing the recipient. jayessell: In a number of cases it did kill the patient http://en.wikipedia.org… but more often than not the bodies immune system would break it down.